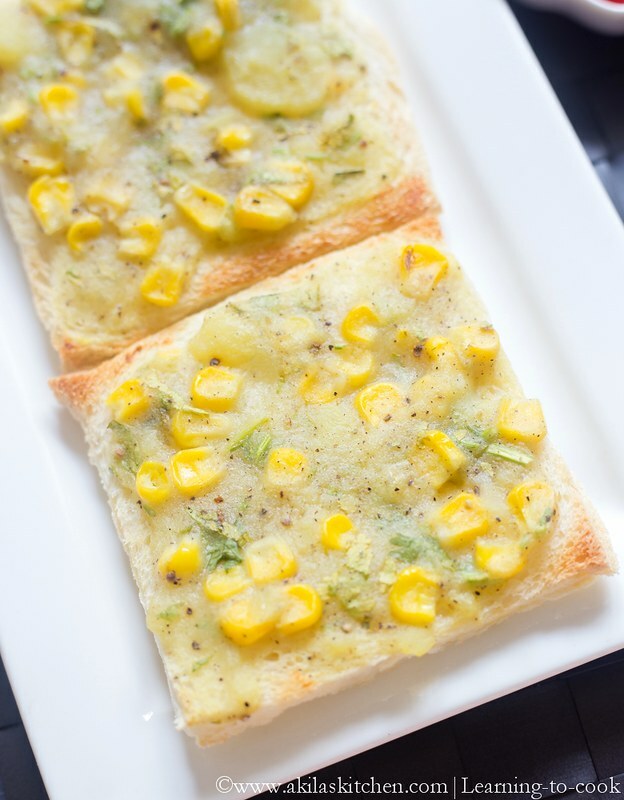 Potato Corn Toast Recipe – This is the latest addition to the bread toast recipes. After I started doing many bread recipes I started trying out different varieties in the toast and this one actually I bookmarked long before from here. It is simple yet tasty and me and my mom loved it to the core as we both are potato and corn fans. Also this would become a great evening snack when kids come home tired and give this kind of hot hot bread toast to them with their favorite side side, then they will really love it. Now let’s go to Potato Corn Recipe immediately. 1. Pressure cook the potatoes and corn. While cooking corn, add a pinch of salt. Smash the potato nicely adding little water and add the corn, pepper powder, coriander leaves and salt. 2. Mix them nicely so that when you apply them to bread, it spreads easily. Sprinkle some oil or butter to the spread. 3. Spread the corn, potato mixture evenly on the bread slices. Keep your oven to 160 deg Celsius and toast till the sides turn to crispy and light brown in colour. 4. Take out from the oven and serve them hot with chilli sauce or tomato sauce. 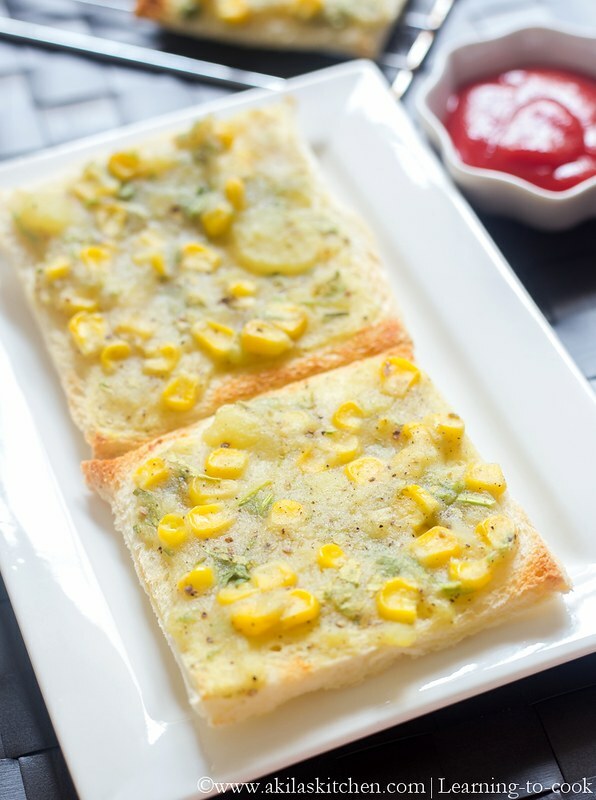 Yummy and crispy Potato Corn Toast is ready to munch on…. 1. The potato should be gooey while applying on then read. 2. If planning to give to kids reduce the pepper and you can add some cheese too. But do not add more cheese as it many alter the taste. Add around 2 tsp of grated cheese. 3. If you like the spicier version you can add the green chillies too. 4. Instead of the coriander leaves, you can also add Italian herbs to give a unique taste. 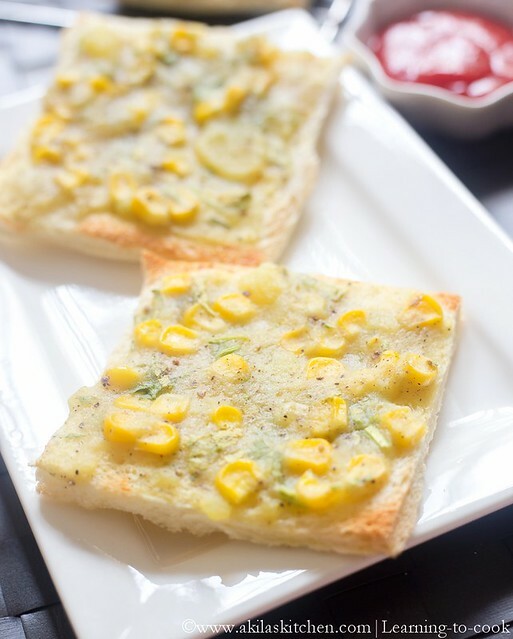 Check my Bread Pizza recipe to know what are the Italian herbs. 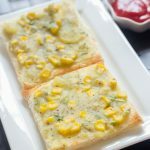 Potato Corn Toast is an easy and simple Bread toast recipe which can be taken as a breakfast recipe or as a evening snack. Pressure cook the potatoes and corn. While cooking corn, add a pinch of salt. Smash the potato nicely adding little water and add the corn, pepper powder, coriander leaves and salt. Mix them nicely so that when you apply them to bread, it spreads easily. Sprinkle some oil or butter to the spread. Spread the corn, potato mixture evenly on the bread slices. Keep your oven to 160 deg Celsius and toast till the sides turn to crispy and light brown in colour. 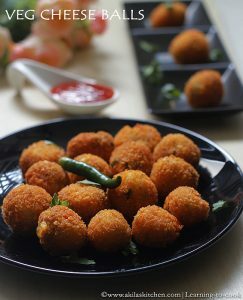 Take out from the oven and serve them hot with chilli sauce or tomato sauce.